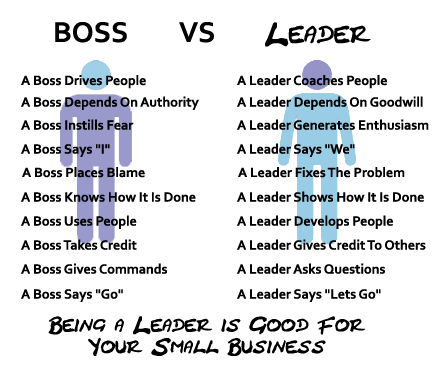 A year and a half ago we did a blog (Being the “Leader” of Your Small Business Rather Than Being “The Boss”) that talked about the differences between a leader and a boss. So today, we decided to share some tips that you can implement every day to be a great leader. 1. Learn to praise employees – and not just in private. Most leaders understand the importance of employees, but most do not know that the best way show to truly their appreciation is publicly. This does not mean calling the media and holding a press conference; it means calling out and praising employees in front of their work peers. Publicly praising employees sends a signal to others on the team that they too could get rewarded in the same manner. Another way to publicly recognize an employee for an accomplishment is to publicly praise them on your social media channels. You would be surprised how far a tweet will go in making an employee feel important and appreciated. Not only do your staffers see the message, but so does their family and friends. As well, your customers will see that tweet or Facebook post, and have much more respect for your company for recognizing an employee. 2. Have a daily plan. A daily morning meeting to find out what everyone’s goals are for the day, helps to establish who is doing what. It also helps employees know where they can step in and help other team-space members, once they have accomplished their daily goal or task. Ensuring employees are on the same page and knowing that they are part of a team, boosts company morale and productivity. Also, breaking your staff into teams will motivate them to succeed for the team – not just to win recognition for their individual accomplishments. 3. Don’t just collect feedback, put it to use. When you listen to open feedback from your staffers and recognize their concerns, you are telling them that you want to make things work better. Take one suggestion each day and bring it up for discussion in your daily meeting. Keep the name of the person confidential, to avoid possible hard feelings from other staffers (but the person who suggested it will know it was their feedback). Follow-up discussions may provide chances to solve potential problems. 4. Encourage peer recognition and a positive work culture. While it is great for employees to be recognized and rewarded by management, being recognized by their own peers can often go further to motivate employees. Ask an employee to stand up in your daily meeting and do a team ‘shout-out’ to another member of the team that did something that truly benefited your organization. Then, at the end of the week, send the employees who were nominated each day out to lunch together. This will not only show them that they are supported by their team, but that management appreciated feedback from their employees. 5. Ask for feedback about management. Ask staffers to write down anonymous feedback about how they feel they are being supported, or not supported, by management. Assure staffers that their comments and suggestions about management will not be seen as negative, but as a positive ways of making changes. A good leader acts on helpful suggestions from employees – or at least address issues by either clarifying them or acting on them. Remember, these are just suggestions that may or may not work in your organization. But what is the harm in trying some or all of them? Just trying to implement one of these strategies into your business will demonstrate to employees that you want to be a leader – and not just a boss.